The E-GO cruiser (developed by Yuneec Technology) has been touted as the best electric skateboard so far. With a blend between speed, elegance and an advanced ecological system, this board is especially designed to take you anywhere. Don’t matter if you are looking for a new economic way of transport or just want fun, the E-GO cruiser will provide you the best quality of skating. With only 13.9 pounds, it becomes the lightest electric skateboard in the world, so you can carry it around without problem. This board has an RWD system controlled by an electric motor placed in one side of the back truck’s section. You should manage your speed using wireless remote technology by sliding up and down a little switch in your controller. Basically, you can ride around with a lot of ease. Also, you can download the E-GO Application and use your Iphone or Apple device as wireless controller instead of using the standard one. Its propulsion system is created with the most advanced earth-friendly technology developed by engineers with more than 10 years of experience in aviation motors. The ergonomic design of all the components of this skateboard provide you one of the most ecological conveyance in 2014. Also, the battery are structured by a waterproof housing that fits to your movements. Simple. If you compare the E-GO with other electric skateboards, you will find that most of them can only take you six miles (approximately) in one charge, while the E-GO cruiser can take you over 24 miles. Also, the price. 95% of the electric boards in the marketplace have a cost over $1,000, while you can get an E-GO Yuneec for only $699 (which is great if you take in count that the quality of the E-GO is top-notch). One of the most powerful features of this electric skateboard is that it can cruising at high speeds. Some experienced riders claim that they are achieved over 13mph, while others claim that just 12mph. The battery recharge time is relative short compared with other boards. You can get your battery full in less than five hours (which is wonderful). 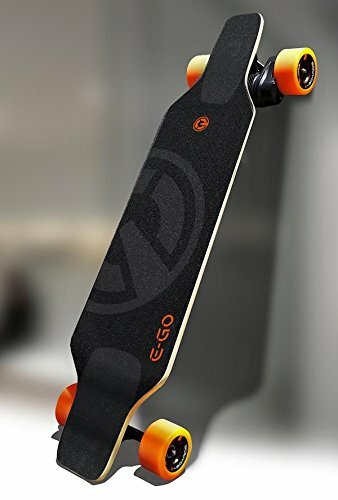 Although there are an infinity of features that the E-Go has, these few that has were contemplated so far, make the E-GO be worthy of being called the best electric skateboard. The deck of the E-Go skateboard has made with eight layers of a blend between fiber carbon and Canadian maple Wood. With 45 Inches in length and 10.6 Inches in width, this board provides you stability and performance when it comes cruising. Also, since this skateboard is too large, is especially created for those riders that enjoy passing through the bends with style and safety. 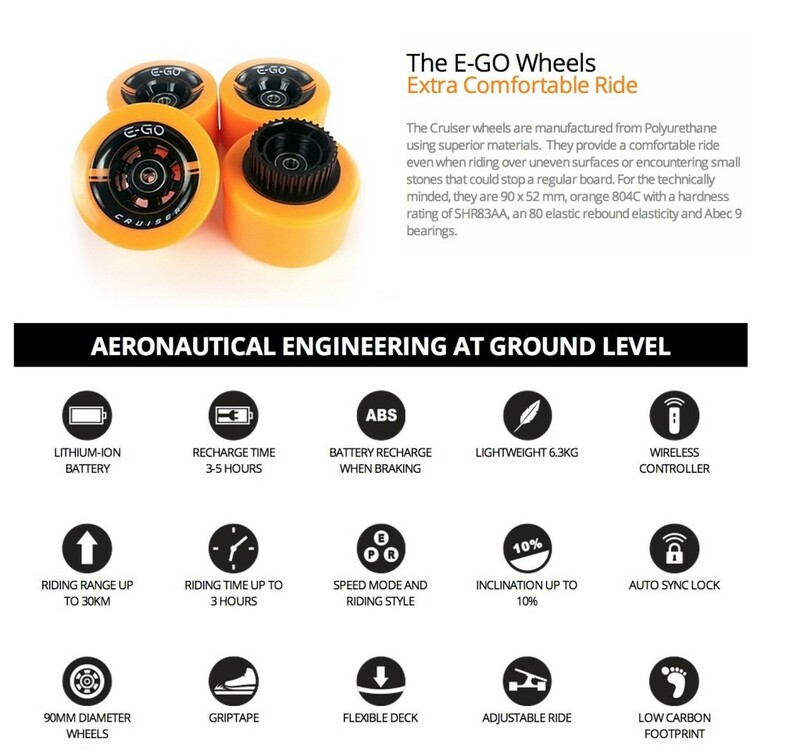 The wheels of the E-Go cruiser are created with top-notch materials that provide you premium quality when you are riding over any kind of surface. 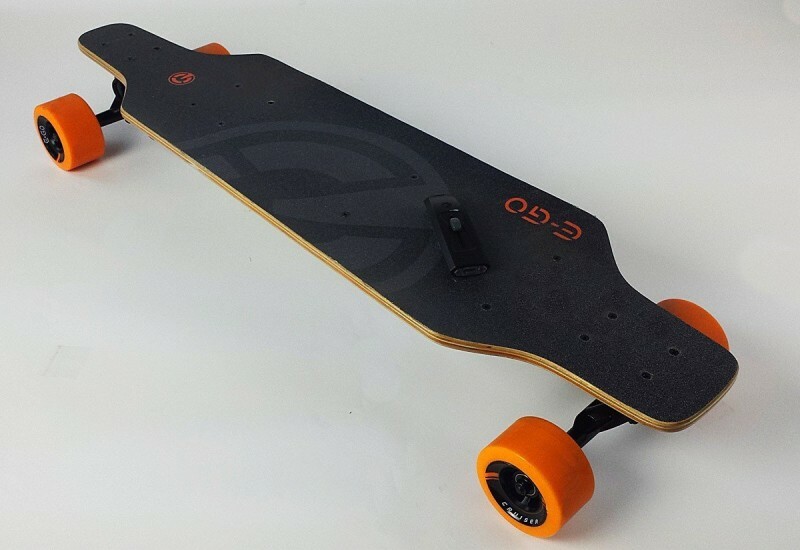 Based on its specs, the E-GO is perfect electric skateboard for those who want to enjoy cruising, taking care of ecology and saving money at the same time. The electric transportation demand is increasing day to day. People that take advantage of the wonderful benefits of riding miles just for a couple of cents, could be called smart. Nowadays, there are a lot of electric skateboards in the marketplace. But if you compare them with the powerful features of the E-GO cruiser, you will find that they are obsolete. E-GO is the new generation of electric motorized skateboards.